We hatched a plan to get from Edinburgh to Huntley in time for opening... excellent, only issue is we would have to set off before 6am, however for the love of Glendronach and to be one of the first to get our hands on the new release, we did exactly that. Although the journey through the most stunning scenery in the world paved the way, we had little time to soak it up, let alone capture the awe-inspiring sights for our blog. For nearly 4 hours, meandering along the highways, cities and towns, we finally arrived at the golden arches – nope we already visited McDonalds, the Dronach Arches that pointed us in the direction of the visitors centre and distillery shop. Before embarking on our tour, we were warned that the distillery was in a working phase, photos within the distillery aren’t allowed – which was a disappointment but understandable. Lewie took us around the distillery, guiding and talking us through the processes old and new. We had a look inside the old kiln – cobwebs and all, viewed the mash tun being re-filled, checked each of the wooden washbacks, witnessing the fermentation process at different stages – the smell was unmistakable. Moving on, we walked through the still room, 4 gorgeous copper towers are working hard to produce the next batch of spirit – two wash and two spirit stills. Unfortunately, the stills are no longer directly fired/heated by the furnaces below – the last distillery in Scotland to do so, now replaced with internal heating elements. Next is the dual spirit safes, housed in the still room - Lewie explains that Glendronach’s new make spirit is on average of 68.7% ABV and is cut back to around 63.5% ABV before cask filling - usually first fill Oloroso and Pedro Ximénez casks. Any spirit that doesn't meet the high standards is recycled back in to the process - nothing is wasted apparently and rightly so. Time to have a few drams which are included in the tour, 18 year-old Allardice, 21 year-old Parliament and the 25 year-old hand filled distillery exclusive. We're not going to review these whiskies in this blog, however in our opinion the 18 year-old Allardice was the superior whisky on the nose, palate and finish. 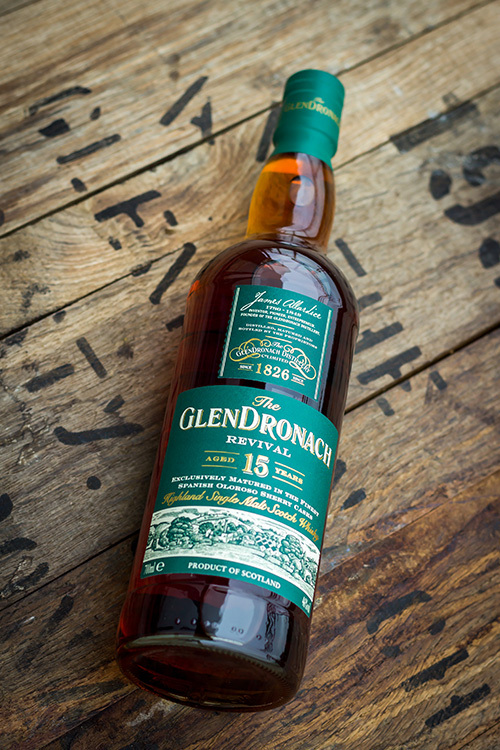 It's a great example of Glendronach, fine balance of sherry, wood and spirit. The 21 year-old Parliament is good but it is a little overpowered by wood, there's not a whole lot of spirit character left and at the price point, the Allardice is a far greater whisky. 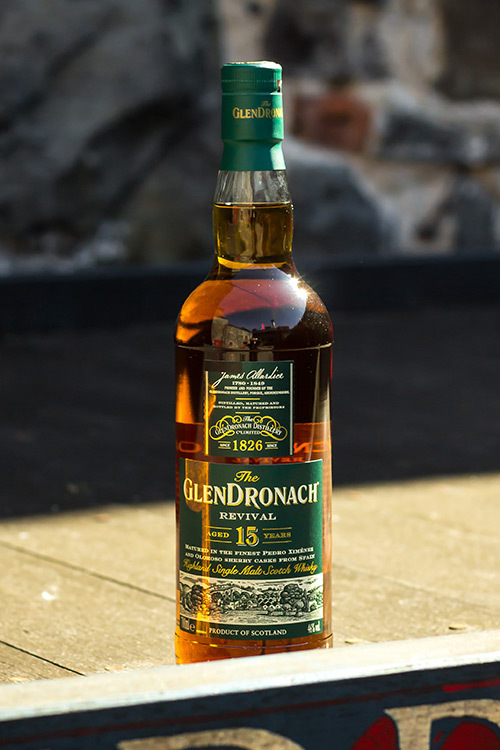 This leaves the distillery exclusive 25 year-old which is quite expensive - £250, for this price we were expecting something along the lines of the amazing Single Cask range, however it was somewhat unremarkable and lacklustre. The Allardice wins. That was pretty much the tour, it was relatively short but informative, hopefully next time we'll get more access to capture more of what goes on inside the distillery itself. Recommended for any Glendronach fan.. So back to why we originally planned the trip – getting our hands on the newly re-released 15 years-old Revival. We were kindly given permission to take pictures on the grounds of the distillery and what better place than the iconic Forgue cart? Time to get some pictures of both of the Revivals together, compare and contrast, a bit of nosing and of course - tasting! Instant Christmas cake and heavily sherried fruits, muscovado sugar, toffee, zingy chocolate orange, old leather – like an old brief case, polish and quite oily. Subtle hints of peat appear if you look closely , usually after a bottle is half finished and sat for a few weeks. Very rich, fruity oil, lots of treacle, toffee, dark chocolate, coffee, muscovado sugar, toasted oak and nuts with dried winter fruits. More dark chocolate and old leather, a decent amount of spice and cloves, hints of cinnamon and sugary honey. Quite long and lingering, wood spices with an orange tang, complex, more Christmas cake, dried dates and raisins. Big and bold wood influence. Feel free to share this post on your social media and/or leave us a comment below about what you think about the old and new Revival release.